This is a combination of the Sun Ray Iron Swing and the bronze metal swing frame. 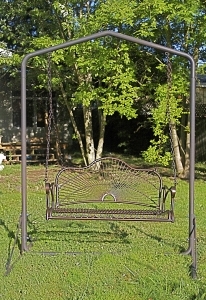 The wrought iron swing has a shiny hammered bronze finish to withstand the elements. It features a beautiful radial backrest with scrolled arms for added comfort. This swing requires some assembly but comes with all the parts you need, including chains, to hang it from this matte bronze metal swing frame. With it's durable metal construction this swing and frame combination is sure to last a very long time. This cushion is designed to go with any of our wrought iron swings and has many patterns available.